From Tamashii Nations. 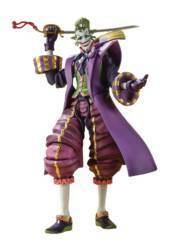 An incredible rendition of Batman's eternal enemy, The Joker, as seen in the hit Japanese anime Ninja Batman! Includes two fans, a katana sword with scabbard, optional head, and four optional pairs of hands.